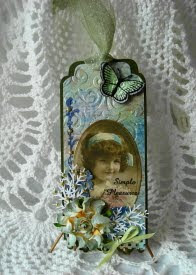 For this tag I used a lot of stamps, credits are; Hero Arts, TAC, Bo Bunny and Rubber Cottage. The Embossing folder is from Sizzix and I cut the tag with Spellbinder Labels Nine. Flower is from Prima, (Camelot Roses). I used the Pine Branch punch from Mc Gill.